One of the toughest parts of life in a small apartment with a house cat is that space is a premium and likely won’t be something you have in spades. 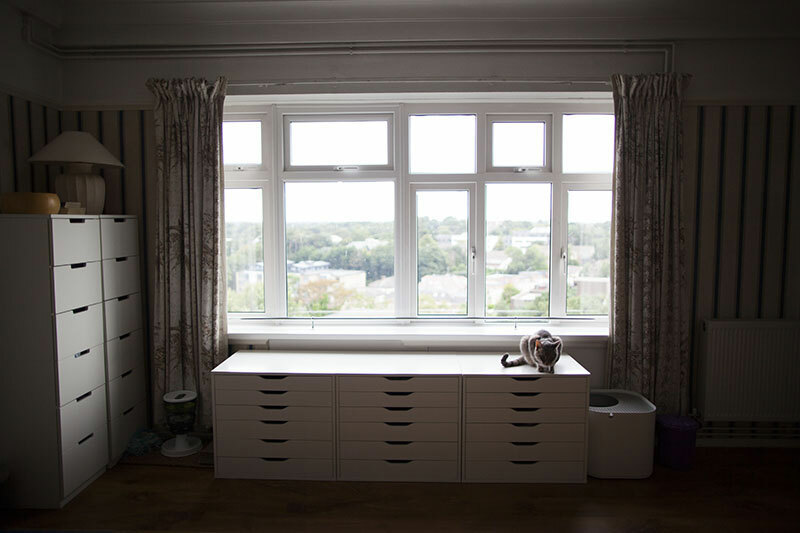 If you end up in a one bedroom, or a studio flat like me, you no longer take square footage for granted, and learn the true value of making the most out of every inch you have. 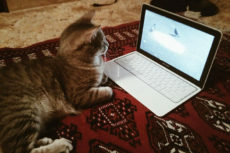 With an enormous house, or even a pretty big apartment, you don’t need to think hard about how to keep an indoor cat entertained. The answer is obvious: invest in massive cat jungle gyms, things like cozy outdoor cat houses that’d work very well inside, and a bunch of other really interesting cat stuff that will help keep your cats busy, fit, and entertained for hours on end. 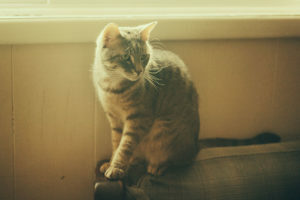 Don’t get me wrong – in no way am I suggesting it isn’t possible to keep indoor cats happy in small apartments. It’s more than possible, and I can attest to that fact having lived in quite a number of small spaces with Avery. 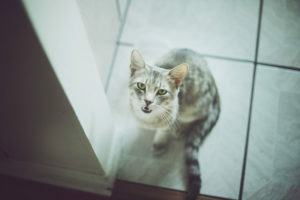 It’s just not as easy to make sure an indoor cat is happy in a small space, and requires more planning than you’d need if you had a great big house. 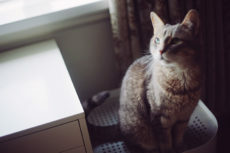 If you’d be interested in reading some of my thoughts on small-space living with a cat, as well as some tips I’ve picked up along the way, check out this article here. 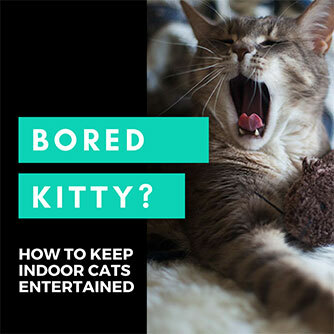 My article on keeping bored house cats entertained is also pretty relevant. Narrow cat trees are one of those things you just don’t think about until you need ’em. 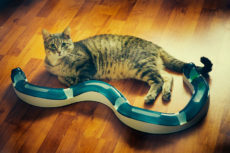 After all, if you have the space, why bother looking specifically for a thin, narrow cat gym when you could invest in a great big one a cat would love more? But for those of us who do need to conserve every inch of space possible, they can be a godsend. Cats genuinely love jumping – or at least my own cat does. And cat trees provide that all-too-needed vertical space that will make a house cat feel like even your small flat is much, much bigger. Imagine extra layers up like having a loft in your flat – you would definitely feel your own apartment was a lot less small if you had another level vertically. 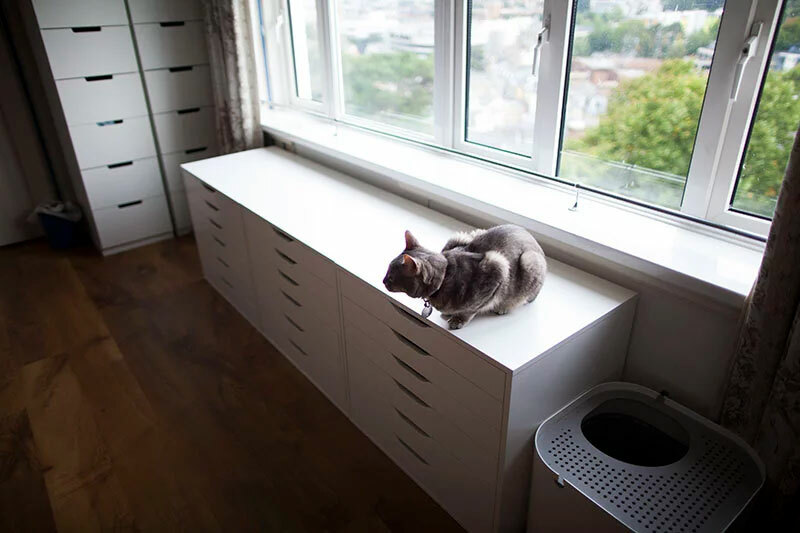 The same is true for cats – adding vertical spaces they can jump on to will make even the littlest apartment, like my own studio, feel much, much bigger since there are so many spaces your cat has the option to hang out in. But enough with the preamble. Let me get into what I think are some of the best options when it comes to narrow cat trees ideal for small spaces and apartment life. I’ll be sharing the dimensions of each of the cat trees I talk about so it’s easier for you to compare right away and figure out what will best fit your space. Edit 03/12/19 – After having moved to a house, I actually bought this cat tree for him (his first cat tree ever) and have had it in my office for months. Avery loves the living daylights out of it – zero complaints. I bought him a second cat tree around the same time as I grabbed this Amazon Basics one, and while the other looks bigger and more sturdy, he pretty much refuses to sit up on the top of the other one – looks are definitely deceiving when it comes to some cat trees. This Amazon Basics one by comparison? Work perfectly for him in the sturdiness department, even though he’s such an incredibly large cat. The way I have it, he typically jumps onto the window ledge for a look out the window, then cozies up in the top round platform for a nap. He’ll typically do this 2-3 times a day at minimum – depending on how much time I spend in my office. Again, he loves this thing to pieces. If you’re looking for the tallest, thinnest options physically possible when it comes to cat trees, at one point or another, you’ll come across these oh-so-amazing looking narrow trees. The catch? Because they’re so anemic, they have to be secured to the ceiling so that when a cat jumps onto them, there’s no problems with the cat tree toppling over. If doing this is not at all an issue, I’d recommend these cat trees above any others, because they’re often much cheaper than others, are completely adjustable in height so they fit all the way to your ceiling, and since they have such a small length and width, you won’t be out of much room at all, and can place them in ever so small spaces. Huge benefit if you ask me. Looking for something in a similar vein, but need an option to fit a taller ceiling instead? 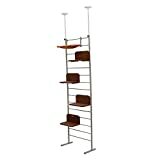 Check out the TRIXIE Santander Adjustable Height Cat Tree. (16×16 inches & 96-108″ high). Want to look through even more options? Check out my article about floor-to-ceiling cat trees. 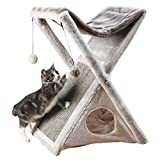 This is not only a really visually unique looking option, it’s also the most heavy-duty narrow, tall cat tree on this list, with one heck of a lot of “features” on it – from having a cat house, to a cat tunnel, to a number of different platforms, and a lovely perch right on top. 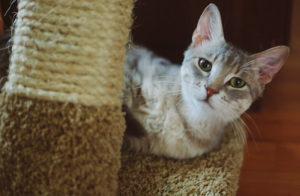 While most of the cat trees on this list are not at all made of solid wood (few cat trees are, but if you’re specifically looking for real wood cat trees try these), this one is not only made of it, but seems to be made of thicker wood than even some of the more expensive, modern cat trees. 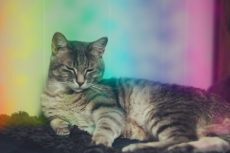 If you’ve been reading KittyClysm for some time, you’ll probably have noticed just how much aesthetics mean to me when it comes to choosing cat products. I went out of my way to buy the prettiest litter box I could find (the Modkat litter box I reviewed here) primarily because I didn’t want to stare at an ugly litter box all day long (I work from home, and in my studio flat, the litter box can’t be in the washroom and so is in the same room I live and work in). The Refined Feline Lotus Tower has been in my sights for ages because of just how pretty it is for a cat tree – it’s just not really available for purchase in the UK. And while the jumping shelves by The Refined Feline are, as much as I like them, I don’t really want to drill so many holes into the wallpapered concrete walls in my current flat. So I keep checking back. Not quite a cat tree, but I had to share this tower since it’s so slim and actually quite a reasonably good looking option for those who prefer minimalist furniture in their apartments. While this climbing tower is on the wide side, since it’s so incredibly thin it’s still likely to be ideal in terms of space conservation in many apartments. Yet another modern cat tree, but I just can’t help myself and always feel compelled to share the prettier options since they’re always on my personal radar. The Sebastian cat tree comes in white or black, making it easy to match up to your furniture. My furniture being all-white, and just having realized this cat tree is now available in the UK, I think I may just snap this cat condo up sometime soon. Will probably need to juggle around already existing furniture in my studio flat to make room, since this cat tree is not quite as thin as many other options on this list, but that’s okay. 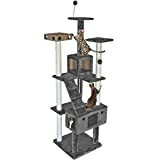 Another oddball cat tree-like item on this list, but if you’re looking for something that’s thin as can be, that you don’t have to secure by drilling screws into if you don’t want to, or that you can drill into walls or doors rather than into the ceiling, these cat climbers are a great option. If you need a cat tree that’s quite a lot easier for a cat who can’t jump very high to use than the typical cat tree, but that’s also incredibly sturdy so he or she won’t fall, incredibly durable (made of solid wood!) and hard wearing, and still pretty slim – I doubt you’ll manage to find a better option. More Trees for Your Cat Without Going Visually Overboard? 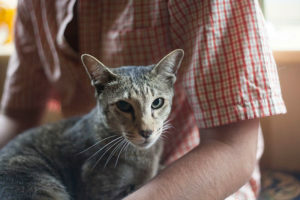 Living in a small space, it can be easy to feel overwhelmed by way-too-much stuff in general; way-too-much-cat-stuff in particular when you’re just doing your best to keep your cat happy is definitely an easy milestone to pass. One fix for this problem might be to pull in one narrow, tall cat tree, next to the most highly trafficked window, then adding extra cat trees of the sort that are exceptionally narrow, floor-to-ceiling types in other places, like by kitchen cabinets or bookshelves so your cat can climb to the top and continue to hang out. These extra-slim pieces are much less visually obtrusive, and they even look like modern shelving and are for the most part quite nice to look at. In case you’re the type who likes to put away pieces to make some extra space when company comes over, there are a couple small cat trees around that are perfect for this. Trixie’s Miguel Fold and Store Cat Tower would be so easy to fold away and stash in the closet, for instance, but really many small cat trees out there are much less visually intrusive than large ones since they can be placed next to sofas and in corners in spots that are not used without towering over human furniture. 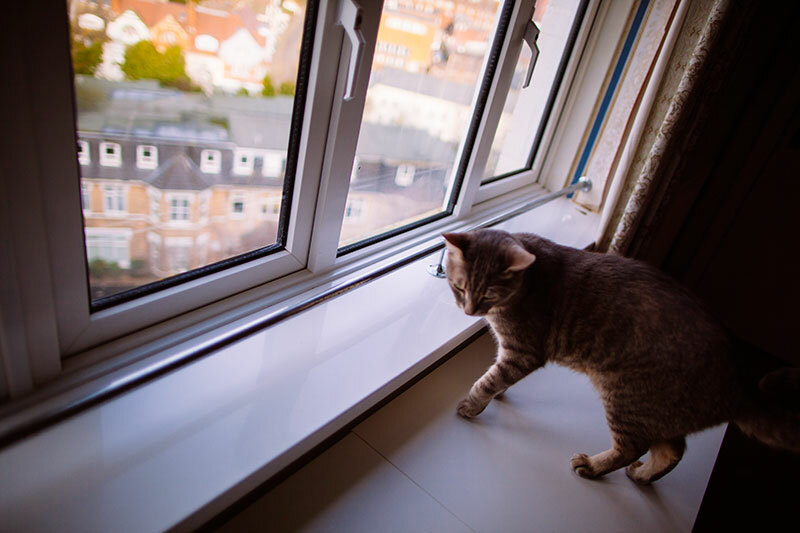 If you’ve got many rooms your cat frequents, having a small cat tree in these lesser used areas may do the trick keeping kitty happy on a tighter budget as well (we all know how expensive bigger cat trees are!). Also, I find if you leave cats without a single object to scratch on in a room, when they feel the urge to scratch, they’ll typically use a piece of “human” furniture instead of wandering off to the room a cat scratch, tree, or tower is in. So using this method could help you save your human furniture from kitty scratches as well. Thoughts on Cat Trees for Small Spaces? Do you personally live in a small space like me? 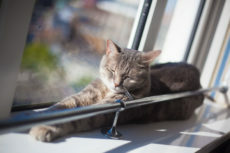 Ever thought about getting a narrow cat tree to help keep your cat happy and fit? If you live in a big house, have you ever wanted to fit a cat tree into a small space? Ever tried a narrow cat tree before? What kind did you end up buying and how did it turn out? Did you ever buy a slim, tall cat tree that didn’t need securing, but turned out too wobbly? Ever drilled a cat tree into your ceiling or wall? Love to learn about your experiences in the comments down below! I find that the new cat trees are made of that velour fabric and cardboard instead of wood and carpet. They can’t dig their claws into the cardboard. This is a good point. I’ve noticed a lot more velour fabric products on the market, too. I’d think the cats would prefer the wood and carpet, and though it probably wouldn’t last as long because the carpeting would be torn to shreds, if you replaced the carpet yourself, it’d probably end up being more feasible in the long run. Would be interesting to test! I like the looks of that Lotus Cat thingy! It’s gorgeous, isn’t it? I love the look of it too! So really interesting cat trees! We’ve made climbing things all over our house, since we already have built-in bookshelves to expound upon. We are considering a cat tree or two, but we need BIG and TALL, not narrow and slim, plus we have 9 ft. ceilings. The Hubby wants to build something, but he’s been saying that for too long without anything materializing. Oh that’s a brilliant idea – using the built-in bookshelves! 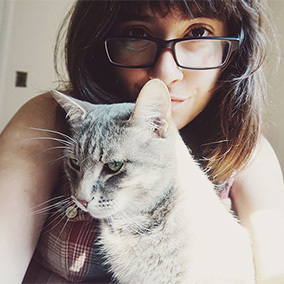 Would love to have the kind of space you do for cat stuff, I can’t wait til I’m in a house and can get at least one more cat and make the house more cat-friendly! I don’t blame your hubby. 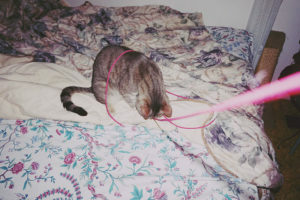 Cat DIYs are definitely the sort of thing you always really want to do, but somehow never end up getting around to. To be fair, most home DIYs are like that for me in general. Still haven’t even painted our second door!